As a graduate from the University of Western Ontario, Melodie completed a Bachelor of Science in biology, and both a Bachelor of Science and Master of Science in foods and nutrition. She is currently employed in primary and long-term care as a registered dietitian. She volunteers her time locally as a board member of a non-profit organization and on a health professional advisory committee as well as abroad participating in a mission initiative that builds homes and provides dental and medical care in the Dominican Republic. Quinoa is considered a grain-type food that has been a staple in the South American diet and is gaining interest among Americans because of the great health benefits it offers and its versatility. It is gluten-free, making it a great grain choice for those with celiac disease, has a low glycemic index and contains fiber, which makes it a good carbohydrate choice for people with diabetes. Quinoa can be incorporated into many types of dishes, including soups, casseroles and salads, and can be enjoyed as a side dish like rice and potatoes. According to the USDA MyPyramid recommendations, women between 19 and 50 should consume approximately six servings of grain foods daily, men from 19 to 30 should eat eight and men from 31 to 50 should eat seven. Of your daily grain servings, at least half should be whole grain foods. The USDA defines one serving of cooked quinoa as one half-cup, or 1 oz. 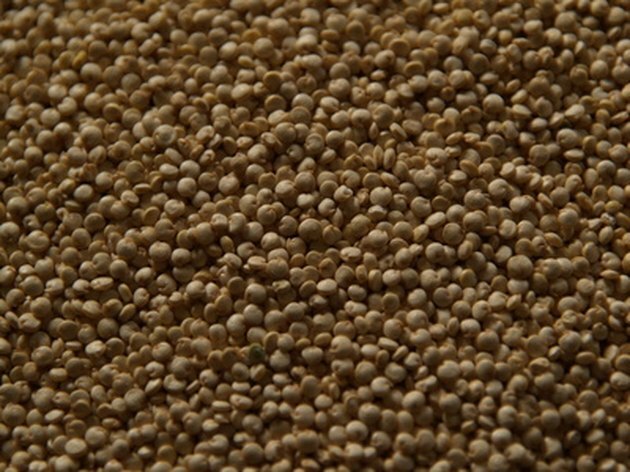 equivalent, about 93 g. This serving of quinoa contains approximately 110 calories. Quinoa is an excellent food to meet your whole grain food servings in a day. There are about 20 g of carbohydrates in one half-cup serving of quinoa. According to the American Diabetes Association, people with diabetes should consume approximately 45 to 75 g of carbohydrate in one meal; therefore, two servings of quinoa, one cup, provides close to your carbohydrate recommendation for one meal. Also, because it is a whole grain food that contains fiber and has a low-glycemic index, it can assist in slowing the rise in blood sugar levels that occurs after eating. Quinoa is a good source of dietary fiber, with one half-cup serving containing almost 3 g. Fiber is the indigestible part of vegetables, fruits, whole grains, legumes and nuts. It contributes to digestive health by keeping you regular and helps make you feel full and satisfied after eating. For good health, it is recommended that you consume 14 g of dietary fiber for every 1,000 calories you consume each day. Quinoa is a great food to help you meet your dietary fiber recommendations. Quinoa is a good source of high-quality protein compared with other grain foods. Protein is an important nutrient for the body, as it is needed for growth and repair functions, and one half-cup serving of quinoa contains about 4 g of protein. According to the Centers for Disease Control and Prevention, healthy women age 19 and above need 46 g of protein per day. Healthy men of the same age need 56 g per day. Including quinoa as part of your meal can assist in meeting your daily protein needs, and it is a great protein source for those who are vegetarian.